The spectrum of the concert possibilities of Surendra reaches from Indian meditation music, called Drupad, up to light, dance-like compositions (songs) with a rather folkloristic character, called Thumri. Classical North Indian concert music. Compositions that are based on the rules of the Indian concert music, nevertheless mostly own dance-like and/or fast rhythms. The translation of Raga means: That which colours the mind (mood). Each Raga has a scale. Both the upward and downward movements of the tones and the importance of the interval are fixed by rules. These scales exist of 5 to 8 tones. The special coloration that is created thereby relates to the ambiences at a certain time of day, when the Raga gets played (e.g. Raga of the morning, evening, night). There are also Ragas, which are seasonally determined (Raga-Megh, rainy season-raga). The Raga starts with an introduction of its tones, intervals and laws. This part is called Alap. It is solemn and without any recognizable rhythm. The interpret grounds the atmospheric picture with a vibrant rhythm. This part is named Jor. It ends in a fast terminal element, known as Jhalla. After that the dialogue between melody and rhythm starts. Now the melody player (e.g. 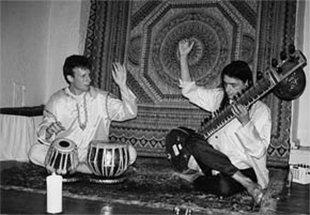 sitar) is accompanied by a percussionist (e.g. tabla). Determined compositions are the foundation for the artist’s improvisation. This part also starts with a slow composition and the changes into ever more rapidly compositions up to a virtuosic end. The artists go by the mood of the audiance and of themselves relating to the prevalent time of day, when he chooses the Raga.